The second edition of this book explores how practitioners can prepare for almost every situation associated with young men. Author and Youth Work Now contributor Vanessa Rogers offers assistance on planning sessions, builds in activities to explore specific topics, then reminds the practitioner throughout to think about outcomes and the next steps for young men. "Working with Young Men; activities for exploring personal, social and emotional issues' isn't specifically directed at young fathers but contains useful exercises through which young dads can explore father-relevant issues, including expressing emotions, risk-taking, masculinities, and so on." "This is a well thought out compilation of activities that would go down well with different groups of young men. It is evident that the author has been teaching for some time, and is aware of class and student dynamics. This is evidenced by the descriptions included of the lessons, with explanation about where to place the pupils or how to engage with them. Each lesson provides an aim and a detailed explanation of 'how to do it', talking the prospective teacher through many of the pitfalls that could otherwise cause them to be tripped up, such as 'blowing a whistle' after a five-minute task to indicate 'time up'. The plans are not overly prescriptive and are in essence a list of guidelines to deliver the session well when using the provided handouts. The handouts can be copied for use within these lessons, and this makes the job of the prospective teacher easier as it prevents them having to trawl the internet for other similar free-to-use worksheets. What this book does is bring these resources all together with advice and guidance on how best to utilise them. Due to the fact that there are so many different sessions included, it should be possible for practitioners to develop and deliver some sort of sessions appropriate for most groups of young men. This book is a useful tool that brings together much work that I have acquired through my career from other locations. The suggested lesson plans and delivery ideas would be invaluable for new teachers or other practitioners such as newly-qualified school nurses. Many of the activities could be used for young women as well, and this would be a useful resource for schools and youth organisations." 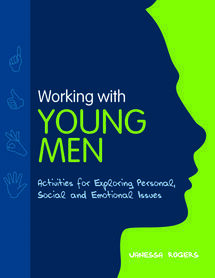 "Work with Young Men" offers a wealth of positive group activities to engage, motivate and meet the needs of young men. Designed to help them improve their self-esteem, raise confidence and develop leadership skills, this book is full of fun and imaginative games and activities that explore issues such as anger, peer pressure, risk-taking and emotional health and well-being. This second edition is fully revised and updated to include 22 new activities ranging from creative warm-ups that develop communication skills to visualising anger through painting and exploring positive relationships through quizzes and group work. This book will be a resource that will be used again and again by anyone working with young men, including youth workers, teachers, pupil Youth Offending Teams and voluntary sector youth leaders."